By Villasenor, David V; Foreword and Editing by Vinson Brown . Healdsburg, CA: Naturegraph Company, 1963. First Edition Glossy Pictorial Wraps Fine in Very Good Wraps 8vo (5-7/8 x 8-3/4), 30 pp with 14 color pages of sandpaintings. Book is FINE -- unmarked -- in Very Good glossy pictorial wraps (slight yellowing, 2 small stains - coffee? -- light diagonal crease upper right front cover. The Man to Send Rain Clouds: Contemporary Stories by American Indians. New York: Richard Seaver / Viking , 1974. Not Stated 1/4 cloth Very Good in Very Good DJ 8vo (5-1/2 x 8), 178 pp including Contributors' Notes. Hardbound book (1/4 cloth with patterned boards, silhouette in silver), is VERY GOOD, UNMARKED -- NOT EX-LIB -- in VERY GOOD glossy pictorial DJ. Authors represented include: Leslie Silko, Anna Lee Waters, Aaron Scott Yava, Opal Lee Popkes, Simon J. Ortiz, Joseph Little, R.C. Gorman, and the Members of Circle Film. 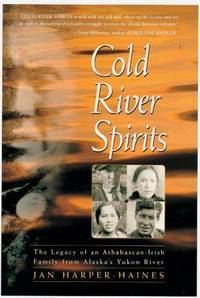 Cold River Spirits: The Legacy of an Athabascan-Irish Family from Alaska's Yukon River. Kenmore, AK: Epicenter Press, 2000. First Edition, First Printing Cloth AS NEW in AS NEW DJ 8vo (6-1/4 x 9-1/4), 191 pp including Koyukon Athabascan Glossary. Hardbound book is UNREAD, UNMARKED, and AS NEW. In glossy pictorial AS NEW DJ. Profusely illustrated with photographs of the families. (h) The Athabascan people controlled the only ways into the interior of Alaska -- the Yukon River and its tributaries. One of the most significant familes were the family that came to be known as the Harpers. This is the story of the coming of the European and American fortune-hunters and the marriages and alliances and cultural assimilation that went on between the Athabascans and the Outsiders. The author, Jan Harper-Haines, tells the story of her family and their history. Fascinating and unique insight into a cultural history.